Output Voltage Range: from 2.7V to 5.25V. Optional Automatic PWM/PSM Version (AIC3415) and Forced PWM Version (AIC3415A). 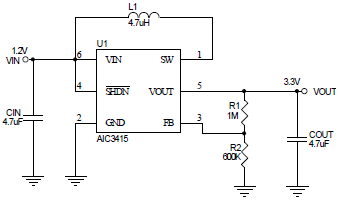 The AIC3415 is a synchronous step-up DC/DC converter. There are two options for AIC3415: automatic PWM/PSM version (AIC3415), and forced PWM version (AIC3415A). The automatic PWM/PSM version enters PSM from PWM automatically when load decreases. The goal is to improve efficiency and reduce quiescent current; the forced PWM version keeps the same operating frequency even when it operates in light load. This guarantees low output ripple and noise. The AIC3415 provides a complete power supply solution for products powered by one or two Alkaline, Ni-Cd, Ni-MH or Li-Lon battery cells. It stays in operation with supply voltages down to 0.5V. The implemented boost converter uses an internal synchronous rectifier to obtain maximum efficiency. A low-EMI mode is implemented to reduce ringing and in effect lower radiated electromagnetic energy when the converter enters the discontinuous conduction mode.